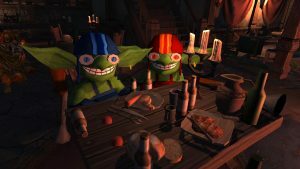 Pictured below we have Goblin troublemakers that are celebrating their horrible crimes. Due to their mischief and some other unrelated game development issues, we are sorry to say that the Closed alpha test is pushed forward for one month, that is, the last day of September. The delay will give us time to sort out any bugs that the Goblins have caused, and add special new features for our upcoming testers! Our trained tigers have been released to bring the dastardly duo in, more on the news as we get it. Are you ready to join the battle? Subscribe to the Closed alpha test and let´s find those Goblins!